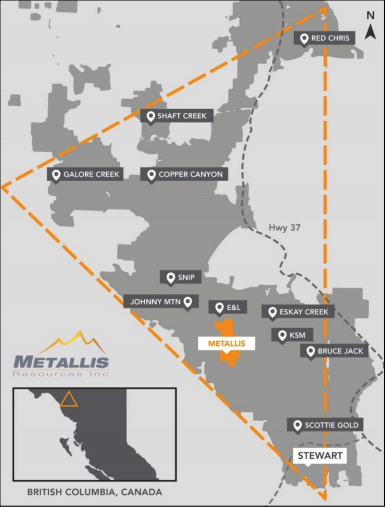 Metallis Resources Inc (TSXV:MTS) is a resource exploration company focused on developing its wholly-owned, 10,600-hectare flagship Kirkham project in British Columbia’s Golden Triangle. Made up of 30 contiguous claims, the Metallis Resources’ property hosts multiple deposits, including copper-gold porphyry and magmatic nickel-copper. The Golden Triangle is a region within Northwestern BC, on the border of Alaska’s panhandle. The district has attracted exploration interest since the late 1800s and is renowned for the discovery of the Eskay Creek and Snip deposits, both of which sit nearby the Kirkham property. While the Golden Triangle used to be relatively inaccessible due to lack of infrastructure and extensive glacial presence, recent developments in roads and power lines as well as receding glaciers have inspired new exploration projects. Within the region, Metallis has established strong relationships, including Garibaldi Resources Inc (TSXV:GGI), currently drilling their E & L project just to the north. Since acquiring the Kirkham project in 2013, Metallis has conducted extensive groundwork and target identification, which helped outline nine different exploration targets across the property. The most recent exploration work included a drill program on the Cliff copper-gold porphyry target, which yielded results of up to 68 meters of 0.52 g/t gold and 0.3 percent copper. Moving forward, the company expects to continue its exploration of the property, advancing its knowledge of the multiple deposits and de-risking the project. Metallis is led by an experienced management team with a proven discovery track record. This includes Metallis’ VP of Exploration Dave Dupre, who was intimately involved in the discovery of the Eskay Creek deposit in the 1990s, making him a key resource in the Golden Triangle region. The leadership team is supported by a strategic technical advisory team that includes industry specialists Lawrence Roulston, Stephen Weatherup and Dr. Peter Lightfoot, a renowned nickel expert who was instrumental to the Garibaldi project located immediately north of Kirkham. Management is also highly invested in the company, holding 10 percent of shares. This is supplemented by strategic shareholders like Eric Sprott, who owns approximately 1 million shares within the company’s tight share structure. In Northwestern BC, 100 kilometers from the Alaskan panhandle, sits the prolific Golden Triangle. The region first emerged in 1861, when placer gold was discovered, launching the Stikine Gold Rush. Since 1918, the area has hosted several gold, silver and other mineral mines including key discoveries, such as the Snip deposit in 1964, which went on to produce 1.1 million ounces at an average grade of 27.5 g/t gold, and the 1988 Eskay Creek discovery, which yielded more than 3 million ounces of gold and 160 million ounces of silver. Up until the last decade, the Golden Triangle region was largely inaccessible due to a lack of infrastructure and significant glacial presence. 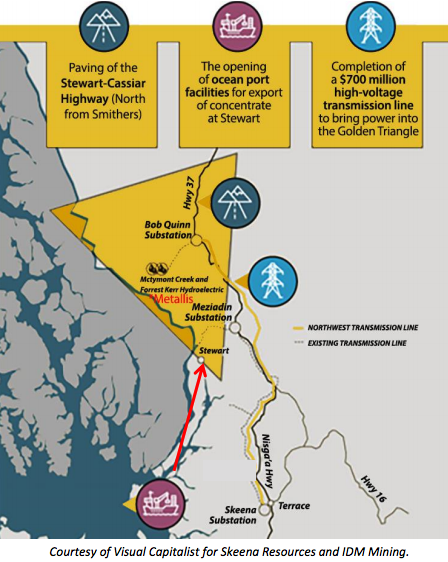 Since then, there have been notable infrastructure developments including the Eskay Creek Road, the completion of a high-voltage transmission line and ocean port facilities at the town of Stewart, BC. Combined with rapid glacier melting rates, this has vastly improved access and offered new exploration opportunities. In 2013, Metallis purchased the 10,600-hectare Kirkham property, located 65 kilometers northwest of Stewart, BC. The collection of 30 claims, including the Mt. Dunn prospect, was carefully put together by Dr. Rodney Kirkham, who spent 29 years of his career as a research scientist with the Geological Survey of Canada. Sitting within the Golden Triangle, the property is close to a number of mines and exploration projects such as Garibaldi Resources’ E&L, Barrick’s (TSX:ABX) historical Eskay Creek mine, Pretium Resources’ (TSX:PVG) Brucejack deposit and Seabridge’s (TSX:SEA) KSM and Iron Cap deposits. Exploration work in the vicinity of the Kirkham property began as early as 1929, uncovering gold results of 17 g/t gold at Fewright Creek. In the decades that followed, a number of exploration initiatives were conducted, leading up to the discovery of the Snip and Eskay Creek deposits in the early 1990s. As the property is made up of 30 claims across 10,600 hectares, its exploration history is segmented and varied. Several portions of the property have seen extensive geological mapping and surveying, as well as some sampling, which have outlined soil anomalies containing copper, gold and molybdenum. In 2009, Paget Minerals Corp. conducted a 5-hole drilling program, covering 1,587 meters. Results from this program included values of 0.13 percent copper and 0.18 g/t gold over 332 meters and 0.22 percent copper and 0.28 g/t gold over 92.67 meters. The geologic contact between Triassic age Stuhini rocks and Jurassic age Hazelton rocks is the key marker for copper-gold mineralization in the Golden Triangle. Most copper gold deposits in the region are located within 2 kilometers of this contact, nicknamed the ‘Red Line.’ The line covers 10 kilometers across the Kirkham property and is thought to be an indicator of potential discoveries on the property. Following the acquisition of the property in mid-2013, Metallis launched its exploration program by conducting a 50-square-kilometer airborne survey, which outlined a number of potential targets for follow-up. Following this, Metallis conducted an exploration work program of geochemical sampling, trenching and geological mapping across the King Anomaly, in the center of the property. In 2015, the company continued its groundwork initiatives, covering an intrusion belonging to the Texas Creek plutonic suite, host to most of the copper-gold mineralization in the Golden Triangle. The 2016 exploration work included a VTEM, magnetic, radiometric survey of 6,000 hectares, which provided further insight into five anomalies on the property, all of which fit the model for the types of porphyry copper-gold deposits found across the Golden Triangle. One of these, confirmed by the survey, is akin to the geological setting and geophysical response linked to the Snip Mine. In 2017, Metallis carried out a comprehensive exploration program focused on mineral deposit models and drilled 5 holes totaling 1648m. This program confirmed a 3-km long, north-south trending corridor of porphyry copper-gold mineralization along the southern half of the 6-km long Hawilson monzonite overprinted by a gold-rich zones of up to 3.36 g/t (KH17-08) Metallis’ technical team reviewed several other targets and identified the potential of (1) Porphyry Cu-Au systems at Camp, Cole, King E and Terwilligen prospects, (2) Magmatic Ni-Cu mineralization at Thunder North and South and (3) VMS/Shear vein Au showings at the Natt, King and Etta prospects. Based on the results from 2017 exploration and drilling program, Metallis Resources conducted a high resolution VTEM survey in 2018 to identify conductors associated with porphyry Cu-Au, VMS-Shear vein Au and magmatic Ni-Cu mineralization throughout Kirkham Property. The Cliff porphyry target hosts a 6 km – long, altered and mineralized porphyry similar to the Red Chris deposit, owned by Imperial Metals (TSX:III). During its first phase of exploration in 2017, Metallis conducted step-out drilling at the Cliff porphyry target, which presented improved copper-gold grades towards the south. The deepest hole from this program outlined results of 0.34 g/t gold and 0.22 percent copper across 148 meters. The second phase of drilling confirmed further copper-gold mineralization and returned results of up to 68 meters of 0.52 g/t gold and 0.3 percent copper. The Company’s recently expanded exploration program has identified several gabbroic units in the previously unexplored northeastern section of Kirkham in areas now referred to as “Thunder North” and “Thunder South”. Mapping and sampling continue at Thunder North and Thunder South to correlate the surface geology with a cluster of airborne magnetic and VTEM anomalies. Both areas are located at the intersection of major east-west and northeast trending faults, introducing mafic-ultramafic rocks. Significant glacial retreat has occurred, exposing altered rocks for the first time. The gabbroic units begin at Thunder South where they outcrop intermittently over a distance of 800 meters. The gabbro is more intensely altered at Thunder North where it’s exposed over 200 meters. The gabbroic units in both areas occur along a northeast-trending fault and include sections with disseminated sulphides. The Thunder North gabbro showings are approximately 4 kilometer southeast of Nickel Mountain drilling. 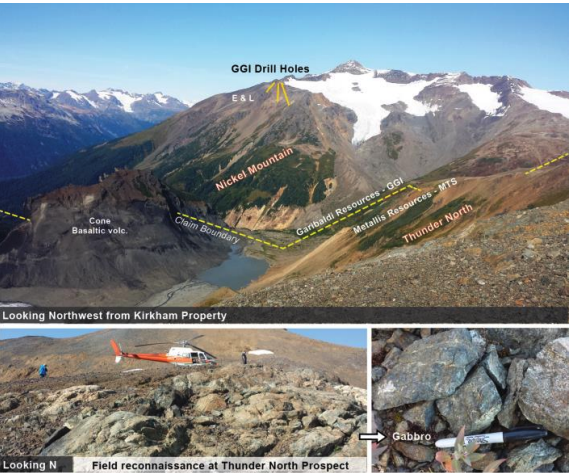 The structural setting at Thunder North and Thunder South extends into Garibaldi’s E&L Nickel Mountain Property with this 10 square kilometer part of Kirkham considered highly prospective for intrusion-hosted nickel-copper, VMS base metal and copper-gold porphyry mineralization. In addition to the Cliff and Thunder targets, Metallis has also identified a number of other targets on the property: King, King East, Fewright Creek, Cole, Natt and Terwilligen. Of these, the King and King East targets will see exploration work over the course of 2018. The King geophysical target is a planar, very strong, coincident low-resistivity and magnetic anomaly. It is situated within the Jurassic Hazelton rocks along the Red-line of Kyba (2014); the Hazelton-Stuhini contact spatially coincident with several prolific deposits including Eskay Creek, Brucejack, KSM, Red Chris, Snip and others throughout Northwest BC. 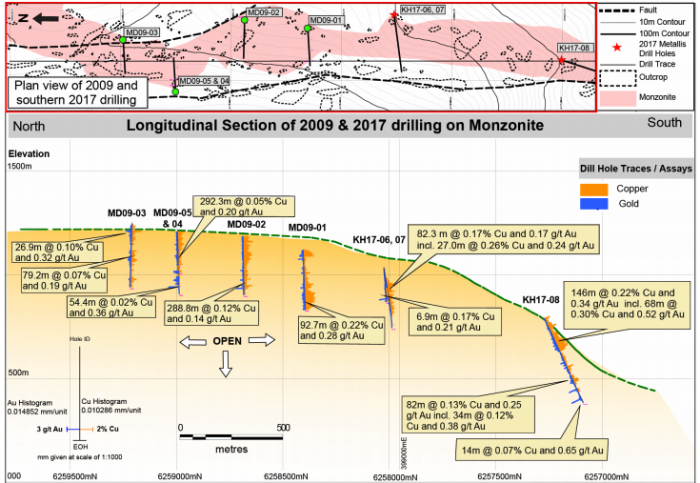 The initial drill hole KH-17-10 from 2017 drilling campaign intersected 38.4m of intermediate agglomerate before passing into clastic sediments which continued to the bottom of the hole at 355m. The drill core logs and assays reflect that the conductive anomaly is attributed to graphitic shale with 5-8mm wide pyrrhotite bands near the volcanic/sediment contact. The stratabound sulphides and several intervals of anomalous pathfinder elements including lead, zinc, silver, antimony, arsenic and mercury are interpreted to be a distal expression of a VMS system. Metallis Resources plans to carry out a vigorous program of geological mapping and geochemical sampling supported by the recent high resolution VTEM survey and plate modelling. The geometry of sulphide conductors, litho-stratigraphic units and associated geochemical anomalies are critical in the discovery of VMS and/or shear vein gold mineralization in this area. The King East target is defined by coincident magnetic and resistivity anomalies. Previous work highlighted numerous narrow gold-bearing veins, small intrusive stocks and anomalous Au-Cu values in soil from sub-crop exposed by trenches in the southern target area. The combined geology, geophysical and geochemical signature patterns identify this area as a copper-gold porphyry target similar to one of the KSM deposits. Results from the 2018 VTEM survey will assist to refine the deposit model and identify potential drill targets. The Cole prospect is located at the northern extent of the 6 kilometer long Hawilson monzonite. During 2017, exploration work outlined a 400m x 200m wide area of gossanous, quartz-sericite-pyrite (“QSP”) altered porphyry outcrops. Alteration mapping indicates a zonation of an intense QSP assemblage surrounded by propylitic, chlorite-epidote-carbonate alteration. Rock grab samples returned values between 0.2-0.9% Cu while soil values returned 300 to >600 ppm Cu and 100-500 ppb Au. The Cole target area represents significant potential for porphyry copper-gold mineralization analogous to the Kerr porphyry Cu-Au deposit at KSM. The Kerr deposit is hosted by a suite of north-south trending intrusive dikes and narrow stocks and contains a Measured + Indicated Resource of 378.4 Mt averaging 0.41% Cu, 0.22 g/t Au (source: Seabridge Gold Resource estimate Feb 2018). The Natt showing is located ~500 meter south of the King Target (outside the 2018 VTEM Central Kirkham block) and is hosted in a succession of volcanic flows, coarse pyroclastic rocks, mudstones, minor limestone and chert beds favorable for VMS style mineralization. The host lithology and anomalous gold values in soil and rock samples of both the Etta and Natt prospects are being interpreted and tested as a vent proximal facies with a siliceous, shallow marine exhalative unit, comparable to the Eskay Creek host stratigraphy. Work during 2018 will integrate VTEM conductors to refine the targets and prospect model. The Etta showing is located ~600 meter north of the King Target. The showing is hosted in a sequence of sedimentary rocks including a 20m thick argillite-siltstone unit with an underlying 2-5 meter thick argillaceous chert unit. A 300 meter long, south trending soil anomaly (Au, Ag, As and Zn) extends from the outcropping chert. Historic grab samples included a pyritic argillaceous chert which returned 0.29 g/t Au, and gossanous boxworks which returned 1.37 g/t Au. Fiore Aliperti is a marketing professional with a 25 year record of achievement in the private sector. He first joined the Company in 2010 and was engaged in corporate development. In 2011 he managed the Company’s Italian subsidiary and was the corporate contact on all Italian matters. He joined the board of directors in February 2012, where he played a key role in commencing the restructure of the Company. In July 2013, he was appointed President & CEO of the Company. As CEO, he has been pivotal in the reorganization of the Company’s business including the reduction of overheads, and the creation of new strategic plans which includes the acquisition of the Kirkham Property and the Mt Dunn Property. Jon Lever has been a Certified Management Accountant since 1991, and has extensive experience in senior financial roles with private and public companies in Canada. He has more than 20 years experience after beginning his career with the chartered accountant firm of Touche & Ross Co. Jon has been involved with several resource companies including in roles as CFO of Tournigan Gold Corp, Wealth Minerals Ltd and Finavera Wind Energy. Sameen Sheikh brings nine years of public company experience to the company. Over this time she has served in various senior roles with several Canadian publicly listed companies that operate in various sectors. This has included time within the resource sector. As Corporate Secretary, she is currently responsible for overseeing corporate disclosure, streamlining processes in accounting as well as the reporting responsibilities of the company, all with the aim of providing benefit to Metallis’ shareholders. Dave DuPre is a professional geologist with over 45 years of experience in mineral and petroleum exploration, major project management and corporate administration of public companies. He has worked and collaborated with both major and junior mining companies in projects spanning North and South America, Europe, Africa and Asia. He brings a disciplined scientific approach to mineral exploration using his excellent managerial skills. Since 1988, he has concentrated his efforts in the “Golden Triangle” area of Northwestern British Columbia. While President of Firesteel Resources, he acquired the ROK Property (adjacent to the Red-Chris Mine) and the Copper Creek property in the very active Sheslay Camp. He was intimately involved in the discovery of the Eskay Creek mine as project manager while at Keewatin Engineering – a major Mining Consultancy that he co-founded. Dr. Abdul Razique brings over 20 years of experience in mineral exploration and mining in Canada and abroad. He obtained his PhD. from the University of British Columbia in 2013 and has worked as a consulting geologist in the Golden Triangle for both Garibaldi Resources and Evrim Resources. He also served with Antofogasta PLC in both Canada and the United States and was a key member of the exploration team that discovered one of the world’s largest porphyry copper-gold deposits at Reko Diq in western Pakistan. Dr. Webb is a Registered Professional Geologist with over 30 years of experience in mineral exploration, development and production in Canada and internationally. He holds a B.Sc. in engineering from the University of Toronto, a M.Sc. in Geological Sciences from Queen’s University and a Ph.D. in Geological Sciences from the University of Western Ontario. During his tenures as president of both public and private companies, projects have been developed from pre-discovery to production. During this period companies under his management have raised over $70 million in development funds. Michael Sikich brings over two decades of business experience in both private enterprise and with public companies to the Metallis team. He is the owner of a real estate company currently employing over 150 people with sales of several hundred million dollars annually. He has demonstrated strength in business management and execution of critical paths and business plans. Lawrence Roulston is a mining professional with over 35 years of diverse hands-on experience. He recently founded WestBay Capital Advisors, providing business advisory and capital markets expertise to the junior and mid-tier sectors of the mining industry. From 2014-2016 he was President of Quintana Resources Capital, which provided resource advisory services for US private investors. Before Quintana, he was a mining analyst and consultant, as well as the editor of “Resource Opportunities”, an independent investment publication focused on the mining industry. Prior to this, he was an analyst or executive with various companies in the resources industry, both majors and juniors. He has graduate-level training in business and holds a B.Sc. in geology. Stephen Wetherup is a structural and economic geologist with over 20 years of global exploration experience. He has worked for Fox Geological Consultants, Phelps Dodge Corporation of Canada and as a consulting geologist for numerous exploration companies including Freeport-McMoran. He is currently the Vice President Geology with Caracle Creek International Consulting and the Vice-President of Exploration for Commander Resources Ltd.
Peter Lightfoot is a skilled geologist with significant experience in the minerals industry (Inco and Vale), Ontario Geological Survey and academia. Responsible for technical aspects of exploration, research and development portfolio, strategic studies of the nickel market, and mentoring geoscience staff. *Disclaimer: The profile provides information which was sourced and approved by Metallis Resources Inc in order to help investors learn more about the company. Metallis Resources Inc is a client of the Investing News Network (INN). The company’s campaign fees pay for INN to create and update this profile page, to which links are placed on Investingnews.com and channel newsletters. By completing this form, you are giving consent to receive communication from Metallis Resources Inc using the contact information you provide. And remember you can unsubscribe at any time.